I know that I myself have been guiltier of seeing only thorns lately. We recently had a lot of negative stuff happen all at once and I am having a harder time than usual seeing the light at the end of the tunnel. 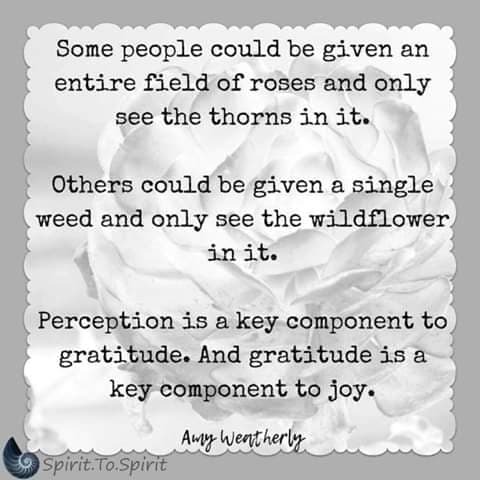 Usually I am one to just shrug it off and stay positive, but I catch myself looking at the thorn instead of the rose in many situations. I received my W-2 and my initial reaction, “Why couldn’t I have made more?” So many thoughts run through my head about wishing I had this and that instead of appreciating what I do have. None of it is mine, anyway right? Everything has been given to us by God. It is all in how we perceive things that affects are joy and peace we find in Christ. I saw an illustration recently that started with a guy in a car envying the person in the car next to him with a bigger and better car. The next slide was someone on a bicycle looking at someone with a car and wishing be at least had a car, and so on. Until the final slide was of a woman in a wheelchair looking out the window and watching people walk by thinking “At least they can walk where they want to.” Let us be thankful for what God has blessed us with instead of what we feel he has not. God is good.